A friend of mine treated me today with 99% chocolate. I am a great lover of dark chocolate, but 99% turn my world upside down. It is much bitter, you cannot consume in great quantities, but then you should not. You should enjoy the taste of every tiny bit melting slowly in your mouth. 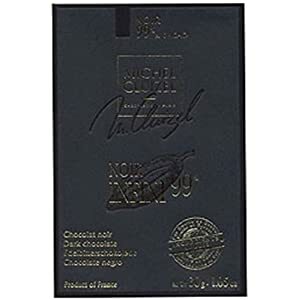 Michel Cluizel used to produce 100% dark chocolate, but now Noir Infini is the best they offer.